The winter season brings with it many seemingly unknowable questions. Why is the weather so cold? Why is the outside so dark? Why do I feel so sad all of the time? And finally, why does everyone have a pom-pom on the top of their hat as if it is a normal decoration, and no one ever talks about it, not even if you ask them directly and are very polite? While the answer to why winter is so cold and dark and sad may never (?) be uncovered, the pom-pom question is a different story. There is an explanation for why you have that ball, that burst of fun, that round smush of fabric on the tippy top of your head. Is it an interesting explanation? Well. Okay. How about — let’s just hear the explanation and you can decide for yourself if it’s interesting. How about that? 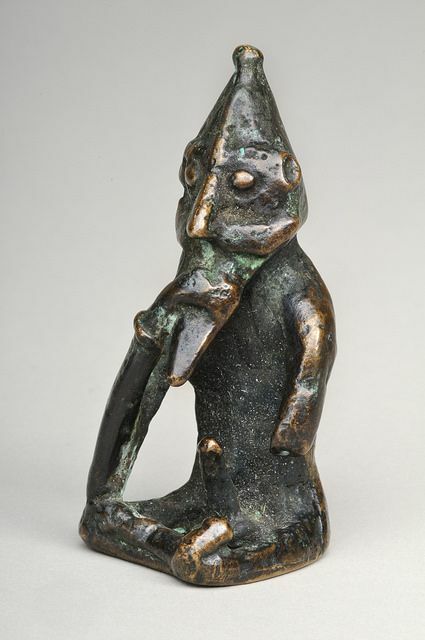 In short, there is only the sketchiest of evidence linking the Rällinge figurine to the god Freyr, and numerous possibilities for alternative interpretation. Not least, we know next to nothing — and have apparently speculated even less — about the figure’s social use, meaning and context. The function of the pom-pom here, as is speculated in this Reddit thread that I found (and I know how that sounds, but I do trust this Reddit user, and I expect you to trust me), could be to cover or gather the seams left from nålebinding the hat, a fabric-creating technique that predated knitting. Yes. It seems right to me that this would be a good reason to add the pom up there. Other hats from history, like this historical 16th-century Monmouth cap, worn by soldiers and sailors in England, feature a little tab at the seam, which is perhaps a link to the modern pom-pom. But what else? The word pom-pom derives from the French word pompon and was adopted in the late 19th century to refer to what you think of when you think of a pom-pom today: a little puff of fabric or feathers or whatever. Proper pom-pom hats were used as part of the military uniform of Napoleon’s infantry, where their color denoted the company to which the man belonged: green for the first company, light blue for the second, orange for the third, and violet for the fourth. Interesting. Sometimes an extra depth of band allowed a pattern of checks or stripes to be knitted in, and sometimes there was a finishing touch of a “toorie,” a bobble made of wool ends; bright red, or more often — for the elderly and dignified — flatter and black to match the bonnet. Roman Catholic clergy have also worn them for roughly one billion years — their pom-pom hats are called birettas — and the colors of the hat and pom-pom tell you what type of guy they are: Cardinals wear red birettas; bishops wear violet; priests, deacons, and seminarians wear black. Oh, my god. Are you bored? Seamen from the 18th century also wore knit caps with pom-poms on them! What an incredible history that we have learned thoroughly. But why do we wear them now, as people who are not old military ghosts, or cardinals, or seamen, unless you are? According to this post on Martha Stewart’s website, which I am having trouble independently verifying but am more than willing to believe, pom-poms had a rise in popularity during the Great Depression because adding a pom-pom was an inexpensive way to embellish clothing. Seems right. It wasn’t until the mid-1960s onwards that the bobble hat became a popular item of clothing [and] moved into the mainstream. An important part of this switch came from a band called “The Monkees” and more specifically band member Michael Nesmith, who wore a bobble hat in the band’s TV programme. The pom-pom hat has been popular for as long as I can remember. (I had a couple I wore all the time as a kid in the ’90s.) I’ve noticed in the past few years though, designers have gotten creative with their pom-poms. I’ve seen fur poms, neon poms, sparkly poms, double poms all hit the runway and then the mass market. Maybe the variety of what you can do in knitwear has contributed to the popularity? I haven’t heard of the hat Michael Nesmith wore, but I don’t doubt that musicians were a main influencer of style in the ’60s! It is entirely possible that Nesmith helped popularize the style in the ’60s, but I would steer clear of a claim that MN’s knit hat is a “big reason” for why we’re all wearing pom-pom hats today. ... It’s all but impossible to locate the origins of most styles, but I must say I was in Italy last January and noticed the really gorgeous knit hats with dyed-to-match fur pom-poms. I knew it. Thank you, Nancy Deihl and her research assistant, Jessica, who collected images to “show ... how popular pom-poms have been through history,” which I’ll share with you now. So, there you have it. The answer to why you have a pom-pom on your hat is: some old thing, and then also some newer stuff.